Fish and chips has long been one of the nation’s favourite dishes. 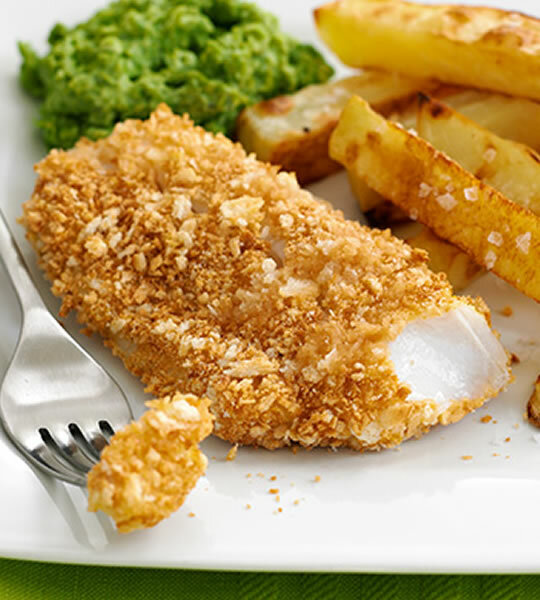 This easy recipe for crispy fish, chips and mushy peas is a lighter take on the old classic as it’s baked rather than fried, and has all the flavour with less of the fat. Preheat the oven to 200°C/180°C fan/Gas Mark 4. Peel and chop the potatoes into thick chips, then toss with the olive oil and some salt. Arrange on a large non-stick baking tray and roast for 20 mins, turning halfway. Lightly toast the bread, then pulse briefly in a food processor to make coarse breadcrumbs. Dust the fish in flour, shaking off the excess, then dip into the egg, followed by the breadcrumbs to coat thoroughly. Bake the fish with the chips for a further 20 mins in the oven, until both are golden. Just before the fish and chips are ready, boil the peas for 3-4 mins, then drain and mash. Stir in the crème fraîche and season to taste. Why not try making this recipe for St George’s Day? To celebrate, we’ll also be having a bundle giveaway tomorrow – keep your eyes peeled! This entry was posted in Talking Ocado and tagged fish and chips, mushy peas, recipe, St George's Day by Ocado. Bookmark the permalink.